Today marks the 103rd anniversary of the battleship USS Wyoming’s christening. This was the third of four naval vessel to carry Wyoming’s name. On May 25, 1911, the battleship USS Wyoming was launched in the Philadelphia Navy Yard. Her keel had been laid just over two years earlier in February 1910 by William Cramp and Sons. In length is equal to that of two ordinary city blocks. In width more than twice that of two wide streets. Its hull sinks into the water to a depth equal to a two-story business block, with as much hull as this above the waterline. Twelve 12-inch rapid-fire until for defense, against torpedo boats. Also fourteen additional smaller guns. Twelve 50-caliber guns which hurl 876-pound projectiles a distance of two miles. Hull is protected by 11-inch steel. After her christening, the entire Wyoming delegation of over 40 people was treated to a sumptuous banquet at the Bellevue-Stratford by the Cramps. Congressman Mondell’s toast turned out to be very prophetic. The USS Wyoming never fired a hostile shot during her 35 years of service, even though she participated in both WWI and WWII. From 1914-1918, she escorted convoys and VIP’s across the Atlantic and served with the British Grand Fleet. After the London Naval Conference of 1930, she was demilitarized and served as a training ship in both the Atlantic and Pacific Oceans. This training was continued during and after WWII. She holds the record for firing the most ammunition of any American ship during the War, firing nearly 2 million rounds through 7 different types of guns while training an estimated 35,000 anti-aircraft gunners. All without a single personnel casualty. 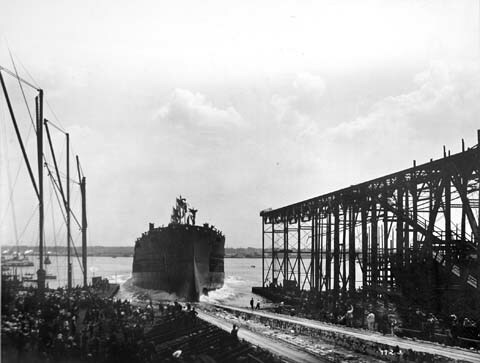 The ship was decommissioned, sold for scrap and dismantled in 1947. 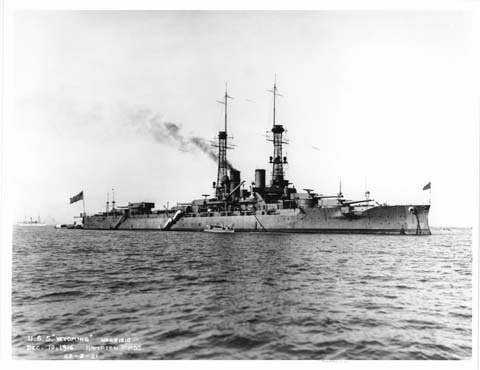 The State of Wyoming presented the battleship with a full silver service, as was the custom. Though the State Legislature allocated some money, the public was given the opportunity to contribute. Certificates were issued to donors for their subscription of at least $1. A total of $7,500 was used to purchase the 50+ piece set. The officers aboard the ship used the silver for 35 years before it was given back to the state when the USS Wyoming was decommissioned. 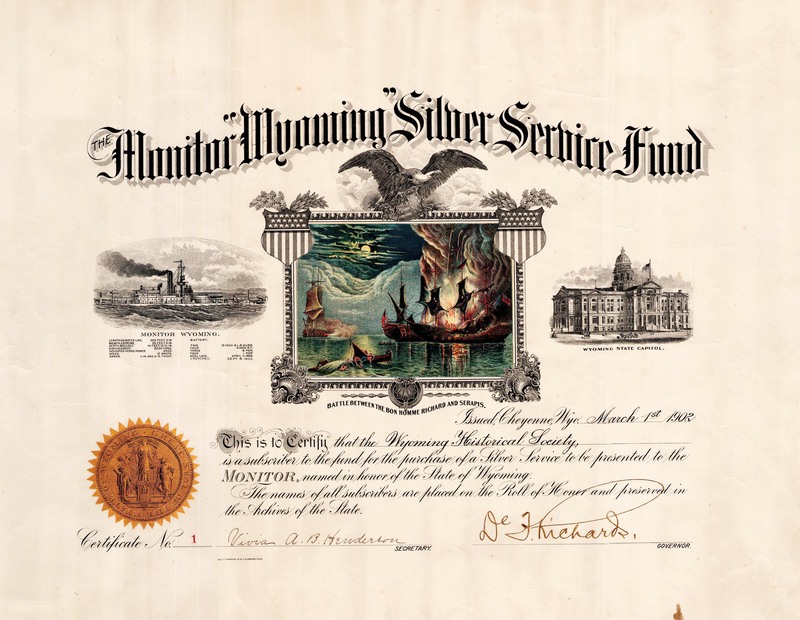 USS Wyoming Monitor Silver service fund certificate issued for donations of $1.00 or more. The Gorham Company of New York designed the silver, with the assistance of Cheyenne jeweler Hugo Buechner. Each piece is masterfully engraved with scenes representing Wyoming and its history. The 24 punch cups are decorated with images of the blue gentian flower, the unofficial state flower prior to the designation of the Indian paintbrush in 1917. The impressive punchbowl can hold 10-gallons and is adorned with figures of Sacajawea and a pioneer woman. The largest platter is 2 feet by 3 feet and bears an engraving of the State Capitol Building as it stood in 1911, before the second addition of both legislative chambers in 1917. 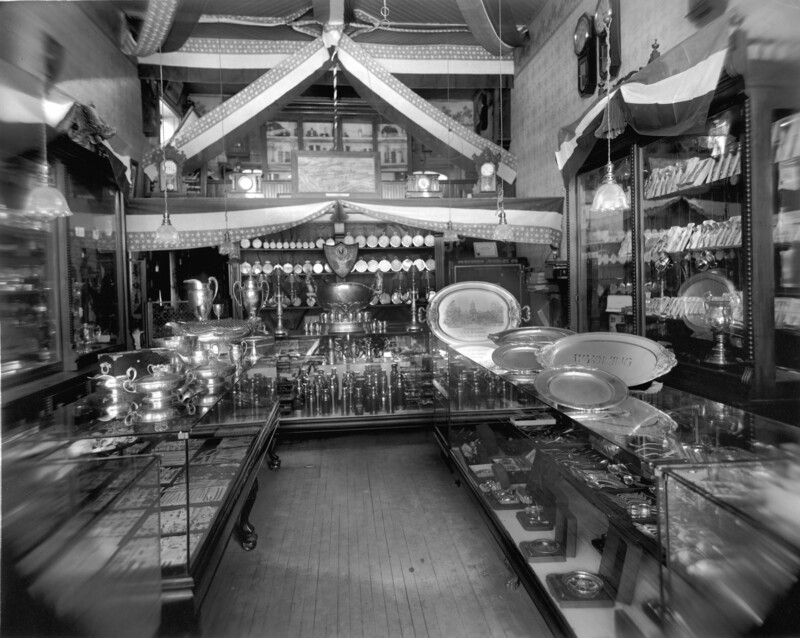 The silver is currently on display in the Wyoming State Museum in Cheyenne. 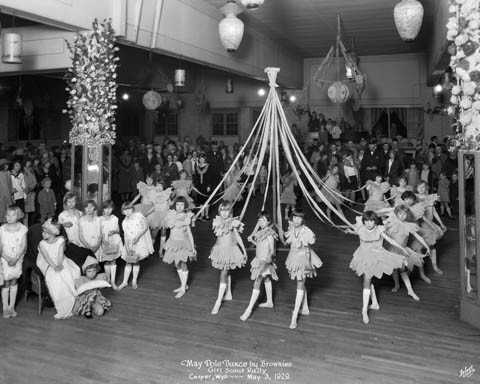 Just a reminder, the Wyoming State Archives will be closed on Monday, May 26th. Our staff wishes you and yours a safe and happy Memorial Day Weekend! Today is the 145th anniversary of the organization of Wyoming Territory. Organization in this sense refers to the establishment of a territorial government. The Territory was created on July 25, 1868 with the passage of the Organic Act of Wyoming. President Andrew Johnson submitted nominations for territorial officers to Congress on two occasions, when he signed the Organic Act and in January 1869. Congress did not take action in either instance, possibly because of the strained relationship between the two parties following Congress’ effort to impeach Johnson. President Ulysses S. Grant offered new nominations for officers after taking office in March 1869. The appointments of Grant’s nominees were approved by Congress on April 7. Oaths of office were completed on May 19, finalizing the organization of the Territory. The officers included Governor John A. Campbell, Secretary Edward M. Lee, Chief Justice John H. Howe, and Justices William T. Jones and John W. Kingman. Campbell had been serving in a semi-official capacity for nearly a month. John Campbell was the longest tenured Wyoming Territorial Governor, serving from April 15, 1869, when he took his oath of office in Washington, DC, to March 1, 1875. He was born in Salem, Columbiana County, Ohio, on October 8, 1835. After the Civil War began in 1861, he joined the Union Army as a 2nd Lieutenant in the 19th Ohio Infantry. He later served as Ordnance Officer and Acting Assistant Adjutant General under General Alexander M. McCook, and Assistant Adjutant General on Major General John M. Schofield’s staff. Brevetted as a Brigadier General in 1866, retroactive to March 1865, he continued to serve under Major General Schofield during the nation’s reconstruction period. Campbell was appointed Assistant Secretary of War in May 1868, a position he held for less than a year before he relocated to Wyoming. He ended his status as a bachelor governor on February 1, 1872, when he married Isabella (Belle) Wunderly. Campbell received a federal appointment, as Third Assistant Secretary of State, on February 24, 1875, and resigned from the office of Wyoming Territorial Governor on March 1. He served with the Secretary of State until he was appointed American Consul at Basel, Switzerland on December 3, 1877. Because of deteriorating health he resigned from this position on February 4, 1880 and died in Washington, D. C. on July 14, 1880. In February 1880, Campbell was forced to resign for his post at the US Consul in Switzerland for health reasons. His wife, Belle, had been running the consul ad-hoc off and on during his illness. Campbell barely survived the trip back to Washington DC and passed away there in July. 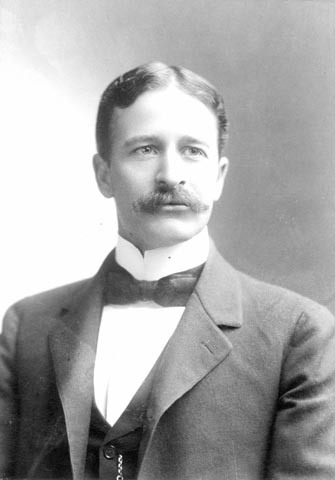 The Wyoming State Archives maintains two collections documenting the life and accomplishments of Governor Campbell. His official gubernatorial papers are organized under Record Group 0001.01. 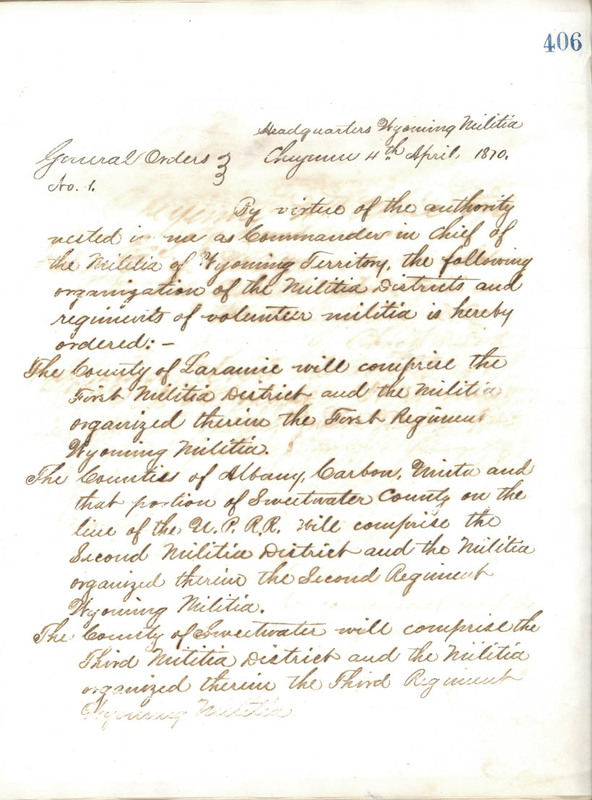 In Executive Order #1, Governor Campbell created the Territorial militia, a forerunner to the Wyoming National Guard. 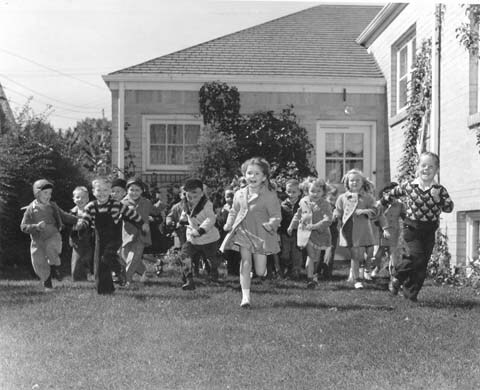 The Archives also holds many personal papers of the Campbell family, cataloged under collection no. C-1049. Most of these records were created between 1860 and 1880. Some earlier school records for Mrs. Campbell, dating from the 1850s, are also included. 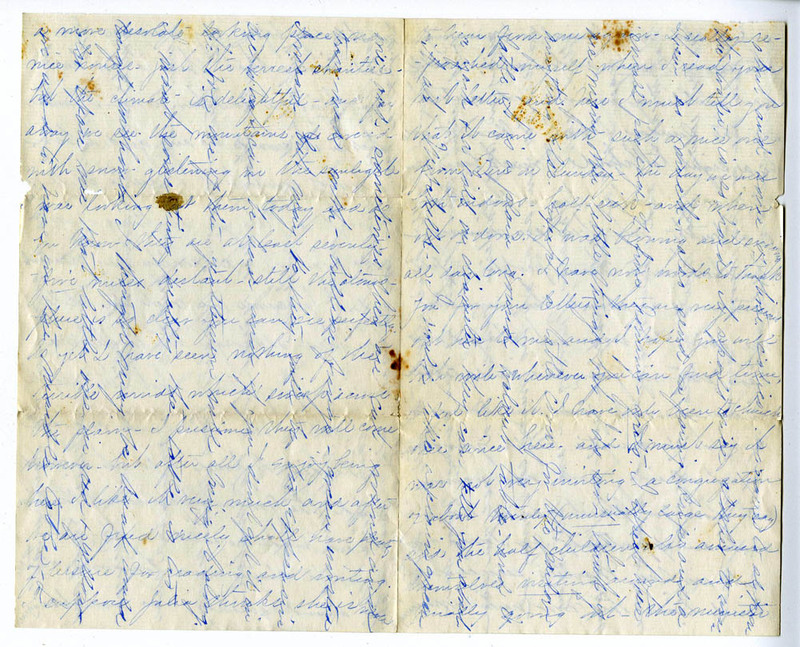 This letter was written from Belle Campbell to her mother on March 27, 1872, 10 days after their arrival in Cheyenne. Belle talks about how “cozy” their new home is but how difficult it is to set up housekeeping. “You cannot imagine a more desolate looking place. No nice houses – just the merest shanties – but the climate is delightful and far away we see the mountains covered with snow glistening in the sunlight… they are at least seventy five miles distant – still the atmosphere is so clear you can see perfectly. As yet I have seen nothing of the terrible winds…” To save paper, Belle wrote down the page as normal front and back, then turned the paper 90 degrees and continued to write across the page. Belle Wunderly Campbell wrote this essay on “Patriotism of American Women” for school in 1861. She was also valedictorian and her speech can be found in the collection. The centerpieces of the Campbell Collection are the diaries and correspondence. 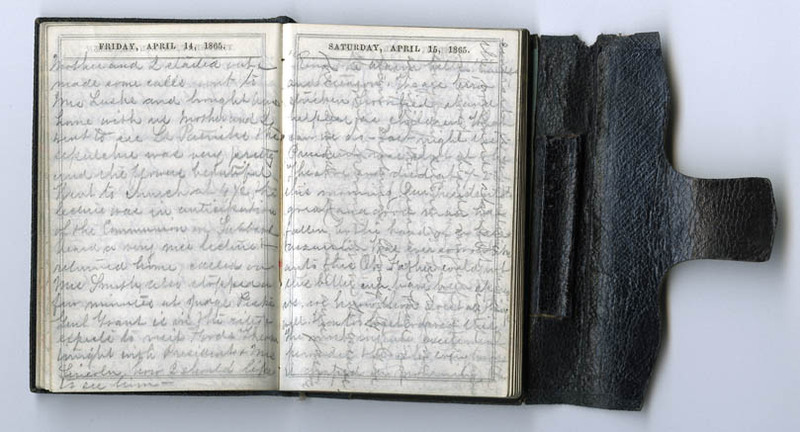 Mrs. Campbell’s diaries include entries recorded when she resided in Philadelphia and Washington D.C. during the years 1864-1866. 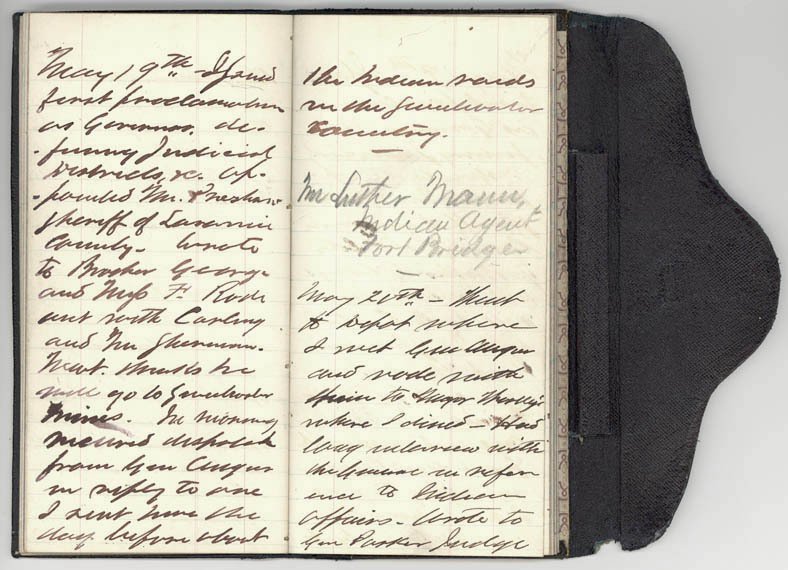 Though most of the entries deal with personal and family matters, the diaries also reveal something of what life was like in mid-19th century America, and provide a few glimpses of civilian reactions to Civil War events, the ending of the war and the assassination of President Lincoln. 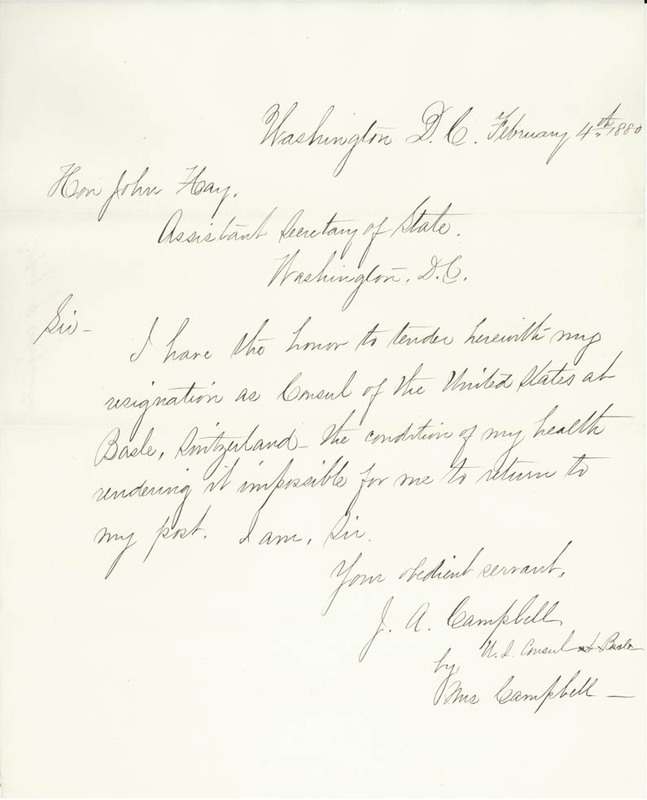 Most of Mrs. Campbell’s correspondence is with family members, regarding topics and events of interest to the family. 20 year old Belle was living with her mother and aunt in Washington DC when President Lincoln was assassinated. “Ring the alarm bells, murder and treason” We are terror stricken horrified, stand helpless as children. What can we do – Last night the president was shot at the Theatre and died at 7-22 this morning… The most intense excitement pervades the city… I am almost beside myself and everybody seems to be insane.” In the week following, she writes in her diary of going to church with the President’s pew draped in black, the crowds gathered to view the body lying in state at the Executive Mansion (the White House), and watching the funeral procession. 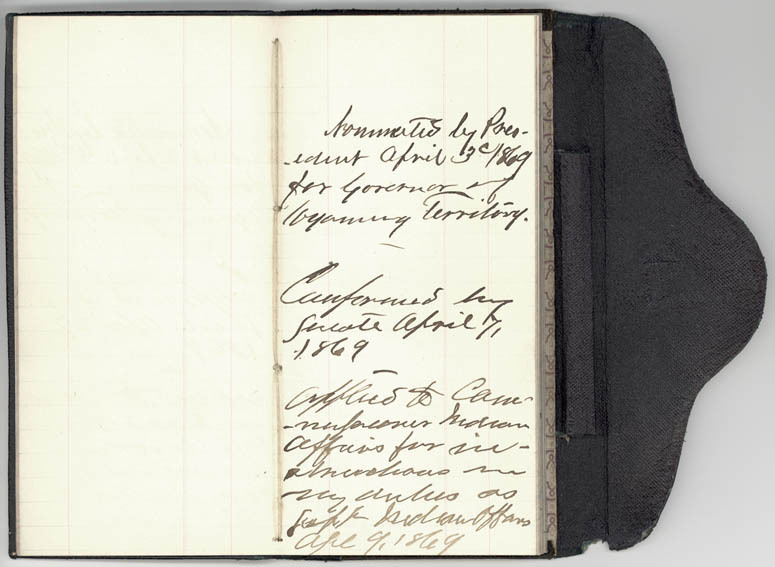 John Campbell’s diaries, 1869-1876, cover his years in Wyoming Territory and almost two years after he left the Governor’s Office. Entries consist of brief recordings of the day’s activities and events. Letters to Governor Campbell are from family, friends, favor seekers, and business and political acquaintances. There are references to and correspondence with Wyoming’s political leaders and United States government and military leaders. “Nominated by President April 3rd, 1869 for Governor of Wyoming Territory. Confirmed by Senated April 7, 1869. The balance of the collection includes Governor Campbell’s military records and an assortment of personal papers. Information on his service during the Civil War is found in mustering records, certificates of rank, and a hand written account of his service. Volumes of published general orders for the War Department and the armies in which he served are also included. Other papers include appointment certificates, invitations, financial records from the Swiss Consulate, and copies of Governor Campbell’s 1871 message to the Wyoming Territorial Legislature concerning his decision to veto a bill to repeal women’s suffrage in the Territory. The message was published by the Pennsylvania Woman Suffrage Association. 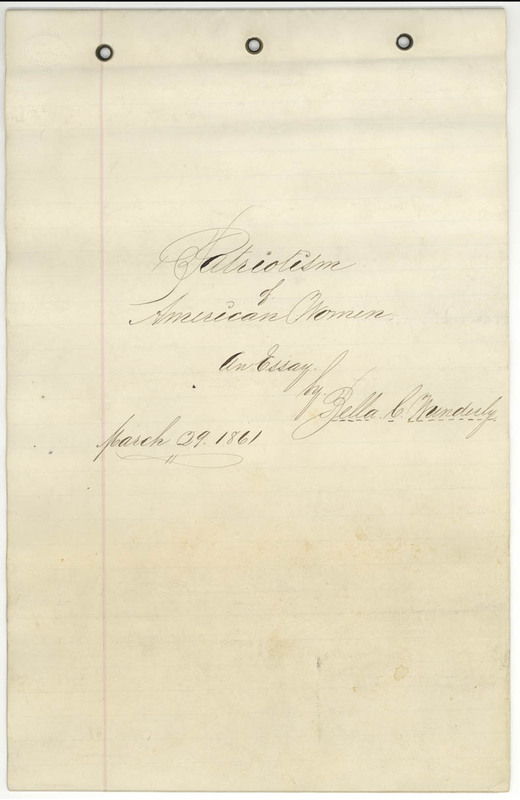 Overall, the Campbell Collection and Governor Campbell’s official records provide comprehensive sources of information on the first years of Wyoming Territory and the lives of its initial first couple. On May 9, 1945, people around the world rejoiced as Germany surrendered to the Allied Powers, ending the war in Europe. Fighting in the Pacific theater would continue until Japan signed their formal surrender on September 2, 1945. 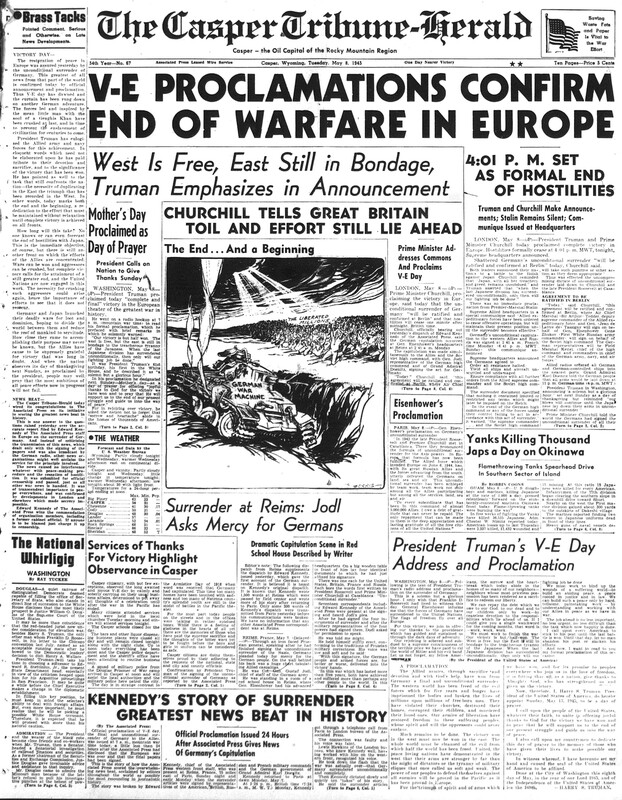 Front page headlines from the Casper newspaper announcing the surrender of Germany. Wyoming sent nearly 30,000 men and women to fight during World War II (more than 10% of the state’s population). Wyoming was also the home to several German POW camps, Heart Mountain Japanese Relocation Camp, and as well as a United Air Lines airplane modification center in Cheyenne. Its May Day! Do we dare hope that spring is finally here in Wyoming?